Staff, clients and companies ‘who just wanted to help’ rallied round Northern Bear plc last month, when a hardy group of golfers defied atrocious North East ‘summer’ weather to wade, wedge, splash and slice their way round the Cathedral Course at Ramside Hall to help raise £6,000 for St Oswald’s Hospice. Left to right:Katy Taberham (St Oswald’s Hospice), Lianne Davison (Senior Accounts Manager, Northern Bear plc). 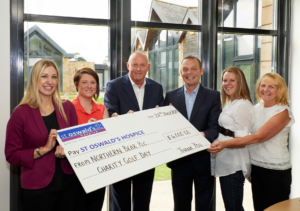 Keith Soulsby (Director, Northern Bear plc), Keith Muldoon Managing Director, Springs Roofing), Danielle Callender (St Oswald’s Hospice) and Wendy Edgell (Company Secretary, Northern Bear plc). Entrance fees from the four – ball competing teams representing companies from both Northern Bear and their clients kept the funds coming in. Sponsors such as Durham car dealer, Pullman Volkswagen, added to the excitement by offering a new Polo for anyone who managed a hole in one – and, despite the wicked weather, there were a number of exciting near misses. Perhaps most significantly, the Golf Competition continued the association between Northern Bear and St Oswald’s Hospice that began last year when the Group selected the Hospice as its local ‘charity of choice’ to help commemorate a decade of trading on the Alternative Investment Market of the London Stock Exchange. The relationship got off to a flying start when the 12 companies in the group sold tickets for a raffle that far exceeded expectations by raising £10,000, which was handed over to the Hospice in December last year. Fund–raising events have continued through 2017 to the extent that the £6,000 raised by the golf competition actually took the total over £20,000. Graham Jennings, Managing Director of Northern Bear plc, commented: “Over the time we have been involved with the staff of St Oswald’s Hospice, we have developed a huge respect for the work they do and the way they do it. Danielle Callender, Community Fundraiser at St Oswald’s Hospice, said: “We’re delighted Northern Bear have chosen us as their local ‘charity of choice’, they’ve done some incredible fundraising for us this year. Their hard work and dedication to raise money has seen them far exceed the targets they set. By completing raffles and golfing challenges Northern Bear have managed to raise over £20,000 which is a mammoth amount. If you’ve been inspired by this story and the fantastic work of Northern Bear, then please visit www.stoswaldsuk.org to find out how you can raise money for St Oswald’s.